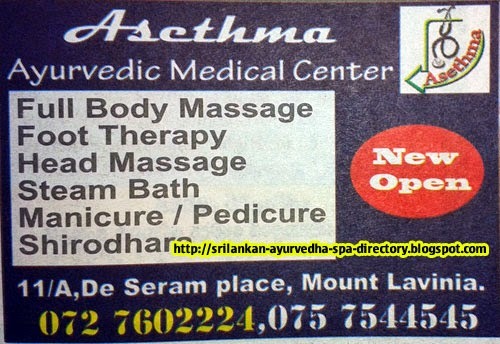 Sri Lanka Massage Places and Ayurveda Spa's Information Directory: Asethma Ayurvedic Medical Center - Mount Lavinia. Asethma Ayurvedic Medical Center - Mount Lavinia. Asethma Ayurvedic Medical Center, 11/A, De Seram Place, Mount Lavinia.